Douglas Cooling & Heating is Going to Celebrate Hoover Day! Do You Need a New AC System This Spring? If you are like many homeowners, you probably don’t think about your electrical system too much, and that’s understandable. Though you rely on it every day, the majority of it is hidden. Wires and circuits are tucked away behind walls, which is great for aesthetics, however, this means that it can be quite difficult to tell when there is a problem. Of course, of all the problems that can afflict your home, electrical problems are perhaps the most dangerous and problematic, which is why it is important to be aware of the signs that suggest that something is wrong. 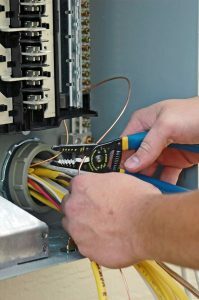 You should be familiar with some of these telltale signs so that you can contact a professional electrician in Hoover, AL right away. Keep reading below to find out more. Surely, you’ve seen the horror movies, and flickering lights are often one of the telltale signs that you’ve got a ghost infestation. However, we are here to tell you that in fact, flickering lights are almost always due to a short circuit in the electrical system. If you notice that it is just one lamp, you may just need to replace that lamp. However, if it is affecting the entirety of your home, you definitely need to contact a professional before the problem gets any worse. If you’ve ever reached for a light switch, or even a random spot on the wall, and noticed it was hot, you definitely have an electrical problem on your hands. Hot spots indicate that points in the electrical system where current is flowing in a direction it shouldn’t be. These hot spots are an indication that there is a very serious breach in the electrical system, which could quite easily lead to house fires if left ignored. Therefore, it is very important that you contact a professional electrician ASAP if you notice any hot spots. Your circuit breaker is designed to protect your home from a power surge. A power surge is when part of your home’s electrical system suddenly begins to carry a voltage beyond safety limits, causing the circuit breaker to trip and shut down that part of the system. Typically, a circuit breaker will trip if you’ve overloaded the circuit. Usually, you can remedy this by unplugging a few things and resetting the system. However, if it seems as though it is constantly tripping, you have a much bigger issue on your hands. It might be that there is an issue with the circuit itself, or it could be that the circuit breaker is malfunctioning. Either way, it is best to call a licensed electrician. If you notice any of the above signs of an electrical problem, do not attempt to fix the problem yourself. Fussing with exposed wiring and high voltages can cause electrocution if you do not know what you’re doing. Always be sure to hire a professional electrician when it comes to electrical repairs. To schedule your electrical repairs, contact the team at Douglas Cooling, Heating, & Electrical. Your experience is what matters most! © 2016–2019 Douglas Cooling & Heating. All rights reserved.